Donate here to sponsor the next Shapree! Do we have to fight poverty on our own, or have the poor already started the fight? Below is a response from our Director of Development, Jordan Harper, to an inspiring article that can be found here, in Christianity Today. Our work in the community started because of one man’s journey through poverty and prison. James Crockett, our Executive Director, experienced the same struggles many of our neighbors face, until his life was renewed by embracing God’s parent-like love. Now James leads a community-wide effort to fight poverty in all its forms: spiritual, economic, academic, and mental. Along with his wife and cofounder Natalie, he is recruiting people like Montrell, who grew up in our rough neighborhood without either of his parents. Gun violence took many of his loved ones, and joining in this violence ultimately led him to prison. But he kept fighting. Montrell completed his GED while in prison and stepped up to take control of his life once released. He enrolled in our job development program, took over as the main caretaker for his recently born son, faithfully started attending our local church, and will soon be hired to help train men and women fighting poverty like he did. This job will go a long way in breaking the cycle of poverty he inherited and give his son a chance to thrive. The fight has already been started by the people poverty affects most. It is therefore important for churches to keep in mind the Chalmer’s Center’s stated goal of participation when joining the fight on poverty: “Getting community members to participate more fully in all that it means to be human” (When Helping Hurts, p. 137) because “[p]articipation is not just the means to an end but rather a legitimate end in its own right” (p.136). When churches are interested in joining the fight on poverty, there is one thing above all else that communities need: faith. They must have faith in people who are crippled by poverty. Faith in the church to be the hands and feet of Jesus. And most importantly, faith in the God of solidarity and miracles. When churches establish faith in these regards, there is a foundation of beautiful relationship which raises community members up, instead of dropping aid in from above. It enables communities like ours to grow leaders like James and Montrell, who then turn around and raise more leaders, creating lasting systems to fight poverty. Once faith is committed and shared, these beautiful relationships can hold up the needs of the community to the resources of the church. Time, money, operational expertise, and connections to various networks outside the confines of isolated communities strengthen those fighting and expand their reach. But it all starts with a commitment to join the ongoing fight, and to bring faith along the way. This week our guest writer, Scott Parker, tells a story of standing strong in our faith instead of relying on the futility of earthly power. What do we choose to ground our identity in? Do we take God’s judgment seriously? Abigail did. She knew “It is a fearful thing to fall into the hands of the living God.” After throwing herself at David’s feet, denouncing her husband and separating herself from his actions, she plead for David’s mercy. Notice that Abigail’s appeal is not to David’s might, but to God’s. Her appeal is to the living God, not to an earthly king. In making her appeal this way, she points David to the source of his power and authority. In essence, she is asking David to remember to whom he belongs. Perhaps years of marriage to a wealthy fool had taught her the futility of earthly power. This woman is standing on a firm foundation and when David meets her it is him that is moved, not her. Late one night I was walking to my apartment on Greenview and Howard. Just ahead of me, I saw a man taunting another man out the passenger window of a car. The guy outside the car reached into the car, opened the door, pulled the passenger from his seat and began to beat the mess out of him. I was immediately reminded of a time I was in the passenger seat of a friend’s SUV, stuck in traffic on Howard Street. I could hear a man berating his girlfriend, I looked over to see the two of them walking down the sidewalk. They were both angry and it looked like he was about to punch her. “Hey man, are you okay?” I shouted, hoping to diffuse the situation. “What did you say?” The man shouted right at me. He leapt into the street and headed right at me. He was moments from grabbing me. “Do you know Jesus man? Do you know Jesus? Do you need prayer for something man?” I whispered through my adrenaline before I even realized what I had said. The man stopped in his tracks. His head fell in shame. He calmed down walked back to the sidewalk. The light turned green and we drove away. It was my go to phrase for moments of danger. It almost always has the same effect. Violent, angry men would stop in their tracks. Had Abigail’s security been grounded in her place as the wife of a rich man, if she had been earthly-minded and appealed to David’s physical might instead of his faith, I wonder how things might have turned out differently for her and her household. When Abigail abandoned the security of her earthly privilege and power she was able to speak to David a life-saving word of correction. Is there an Abigail in your life? A David? A Nabal? Do we see God’s righteous judgement aimed at our household, church, city, nation? By what authority do we presume to speak into the lives of the poor or powerful in our city? What steps of repentance can we take to abandon our earthly security and step into the role of an intercessor? "Those who cling to worthless idols forfeit the grace that could be theirs. But I, with a song of thanksgiving, will sacrifice to you.” - Jonah 2:8-9. This week our guest writer, Curt Berg, looks at the work of solidarity in Rogers Park as a “call to carry the cross.” Where might your call take you? Lent is a journey many church communities symbolically walk with Jesus on His road to the cross. Throughout this trip, there are twists and turns. Many things happen to you that you would not expect. The big one is when a Roman soldier stops on the path, looks at you and shouts, “YOU! Carry the cross!” You think…What? Who am I? Why me? Maybe I don’t want to! Oh, oh, not a good thing to say when a Roman soldier gives you a command. Your life could be in great danger. relationships, needs that can’t be met immediately, unplanned events, joys and sorrows. I also see people like Simon from Cyrene in Matthew 27:32, who are asked to carry the cross, but don’t feel equipped to do so. Yet, because they are asked, they get the job done. If you asked me to carry the cross I would be overwhelmed by the enormous task you’ve asked me to do. But when the need is there I would hope I would step forward and carry the cross. How about you? Are you willing and able this Lenten season to consider the offer to carry the cross? though it’s an overwhelming task. It’s also a huge responsibility and carries a lot of stress. of Howard neighborhood. It may seem calm and peaceful on the outside, but internally there is despair, fear, and addictions. As we expect the unexpected and bring the hope of Jesus who can make crooked paths straight, we thank the LORD for using C24/7 to accomplish His will and ways in and through others. May this season of Lent draw you nearer to our LORD and Savior as we contemplate the way to the cross and all it brings! This week our guest writer Scott Parker, a pastor at Park Community Church, asks us to sacrifice our pride to continue our work of solidarity in the neighborhood. You can pray with us during Lent! Click here to download our Daily Lent Prayer. Work in the neighborhood can be like this sometimes. You finally see an addicted single mom walk into a recovery program. You confront the drug dealer, survive and he stops selling. Rent is due, and you can’t pay because you’ve been doing the work for free. “I’m seeking you first,” you cry out. Then someone shows up the next day with a check. God is with you. In chapter 32, Jacob’s sins come to meet him. He had swindled his warrior-hunter brother. He had stolen the blessing and tricked him out of his birthright. Fourteen years of free labor gave Jacob the moral high ground with his father-in-law. Yet against Esau this was not so. With Laban, Jacob could cry out for justice, but with Esau, justice would mean his own destruction. In this season, where are we feeling self-righteous? Where are we feeling worthy? Is it because of our work with the poor? Are we God’s special child because of just how many people we’ve helped? Or victories we’ve won? Rules we’ve kept, memorized, studied? Ash Wednesday marks the start of Lent: a journey many church communities symbolically walk with Jesus on his road to the cross. Throughout this trip, Jesus pulls the cosmic notions of sacrifice and solidarity closer and closer together. While one hand yanked at personal pride and called on privilege to humble itself, the other pulled the rejected, abandoned, and destitute people of the earth into Divine community. Our call during Lent, should we choose to accept it, is to embrace this path: to live simply and strive toward deep relationships with those the world casts aside. C24/7: Father’s Arms Ministries tries to live at the intersection of sacrifice and solidarity. As a community we acknowledge that renewal only comes through admitting our personal shortcomings, as well as those of our society. We try to embrace the new life we are given in Christ, instead of relying on pride, status, or extravagance to comfort us. This requires an incredible amount of “letting go,” and undoubtedly, we often fail. On our good days, though, the one hand of sacrifice brings us into community with people who suffer from systematic inequality, personal temptation, and societal negligence. Solidarity, suffering alongside others, is at the very core of Jesus’ being. He came so people of the world could find hope in the darkest of places (Luke 4:18-19); love where it shouldn’t exist. He specifically sought out those who were sidelined because of their ethnicity, gender, economic status, perceived religiousness, and health. If we take seriously the path to the cross, we should find ourselves communicating the inherent worthiness of all people to those we encounter. It shouldn’t end with words, though. Our presence in people’s lives matters. Our attention and our empathy matter. Our healing touch, time, and financial support all matter. To all people. Those who need us the most, and those who think they need us the least. Today, as we celebrate Ash Wednesday, we are confronted with a not-so-subtle reality: “for dust you are and to dust you will return (Genesis 3:19b).” This painful and humbling reminder should help us in dropping our pride and seeking sacrifice. This simple sentence can remind us 21st century citizens that we don’t hold nearly the power we think we do. Once we learn to sacrifice, may we sprint toward solidarity with our fellow “dust mates,” with an eye on the ones who are all too aware of their dust status. Today and every day. Amen. Today the cross stands before me, as it did you. This suffering world engulfs me, as it did you. A feeling that God has somehow grown distant, pervades me, as it did you. A yearning to be whole still beckons me, though, as it did you. While the cross stands before me, I am never burdened with the entirety of its unruly weight. but instead the one who cared enough to love it perfectly. Help me love it perfectly, just as you do. Amen. We have many things to thank God for! 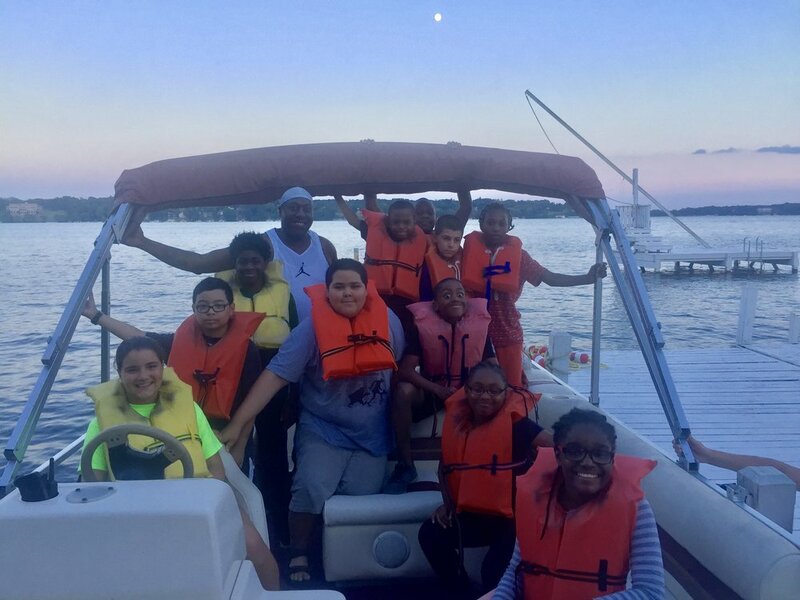 2017 marked the year of C24/7's First Annual Summer Camp! The month started off with only 5 participants and by the end we had a total of 17 students participating. Our volunteers played a large part in helping create a fun filled camp. We had the opportunity to make individual pizzas, swim in the lake, read together, study the Bible, play football, create crafts, have picnics and much more. Here are a few pictures to recap our summer of 2017! What a blast!!! We all had a wonderful time adventuring together at Lake Geneva's Covenant Harbor. Students experienced outdoor activities that they have never had the opportunity to experience before. Check out a few pictures from our trip. Thank you to Willow Creek North Shore and generous support partners for making this trip possible!